Despite orders from the government to help disperse Islamist protesters, Pakistan's military has reportedly chosen not to intervene. Hardliners are demanding the resignation of the law minister over a blasphemy row. On Sunday, Islamist activists clashed with police for a second day outside the capital, Islamabad. Pakistan's government on Saturday called on the country's powerful military to be deployed in Islamabad after deadly clashes broke out between police and religious hardliners. But Pakistani media reported Sunday that after a meeting with the civil administration, military officials decided not to "use force" against the protesters and instead engage in political negotiations with them. Local media said the civilian administration was in agreement with top military officials on that. There has been no official confirmation of the development, although Major General Asif Ghafoor, head of the military's public relations department, tweeted Saturday that the country's army chief, General Qamar Bajwa, advised PM Shahid Khaqan Abbasi to resolve the issue peacefully. At least seven people were killed and more than 200 people were injured — around 137 of whom were security personnel during clashes on Saturday and Sunday — when violence broke out as police moved to break up an Islamist blockade, which had paralyzed the capital for weeks. Security forces fired rubber bullets and tear gas while protesters burned police vehicles and reportedly hurled stones at security forces. Some 8,500 police and paramilitary troops in riot gear launched an operation Saturday to clear at least 2,000 protesters who have blocked a main junction between Islamabad and Rawalpindi for almost three weeks. 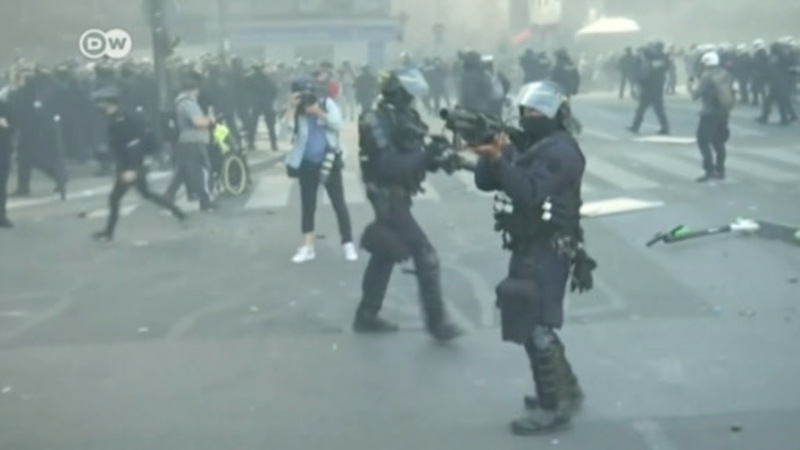 Police have arrested at least 150 protesters, according to local media. Hardliners belonging to the Barelvi sect of Islam have reportedly demonstrated against police operation in other cities, including Karachi, Lahore and Peshawar. On Saturday, the Pakistan Electronic Media Regulatory Authority (PEMRA) ordered private TV channels to go off air, citing security concerns. Pakistani media is not allowed to broadcast live coverage of a security operation. Coverage was restored Sunday. Michael Kugelman, an analyst at the Washington-based Wilson Center, told the Agence France-Presse news agency the success of the protest was "highly disturbing." "It speaks to the clout and impunity enjoyed by religious hardliners in Pakistan," he said. The controversy erupted in October, when the government amended electoral laws, including the wording for the swearing-in of lawmakers, who must recognize the Prophet Muhammad as God's final prophet. After protests from religious groups, the government restored the oath in its original form, which was seen as slightly more legally binding. "Our sole demand is the authorities act against those members of parliament who amended the constitutional clause related to the 'finality' of Prophet Muhammad," Hafiz Ullah Alvi of the hardline Tehreek-i-Labaik Ya Rasool Allah Pakistan party told DW. "The government said it was a clerical error. We don't think it was the case. It was done deliberately by the West's agents, who are also members of our parliament," Alvi said. "We will not leave. We will fight until end," Ejaz Ashrafi, the spokesman for the Tehreek-e-Labaik party, told Reuters on Saturday. Many Islamic groups in Pakistan are against parliamentary democracy and want it replaced by the Islamic Shariah model. Since November 8, the Tehreek-i-Labaik party's followers have blocked a main motorway interchange that connects Islamabad to Rawalpindi, causing severe traffic jams and inconvenience to the capital's residents. Fearing the hardliners could storm government offices in Islamabad, the authorities, too, sealed off several roads, which worsened the traffic situation. Usman Azam, an Islamabad resident, told DW the blockade was causing problems for citizens. "Protest is the fundamental right of every citizen, but these protesters should not put the city under siege," Azam told DW. The main demand of the protesters is that Law Minister Zahid Hamid resign from his post, as by tampering with the oath, they claim, he has committed blasphemy. "We will not unblock the roads and keep Islamabad under siege until our demands are met," Alvi said. Blasphemy is a highly sensitive topic in the Islamic Republic of Pakistan, where around 97 percent of its 180 million inhabitants are Muslim. Rights advocates have long been demanding a reform of the controversial blasphemy laws, which were introduced by the Islamic military dictator General Zia-ul-Haq in the 1980s. Rights groups say the laws have little to do with blasphemy and are often used to settle petty disputes and personal vendettas. Religious groups oppose any change to blasphemy law and consider it necessary for Pakistan's Islamic identity. Blasphemy allegations have often led to violent riots and vigilante justice in the country. The ruling Muslim League of former Prime Minister Nawaz Sharif is already under pressure from the judiciary after Sharif was ousted on corruption charges in July. While opposition politician Imran Khan is demanding early elections, Khadim Hussain Rizvi, the leader of the Tehreek-i-Labaik Pakistan party, has also seen his popularity rise in the past few months. In September, Rizvi entered mainstream politics and, to the surprise of political observers, won more than 7,000 votes in a Lahore by-election for the seat vacated by Sharif. Experts say that the protection of blasphemy law is central to the Tehreek-i-Labaik Pakistan party's political agenda. The outfit vows to continue the legacy of Mumtaz Qadri, who was hanged in February 2016 for murdering Salman Taseer, a governor of Pakistan's eastern Punjab province. Qadri shot Taseer 28 times in broad daylight in Islamabad on January 4, 2011, and was sentenced to death in October the same year. Qadri said he had murdered the former governor for his efforts to amend the country's blasphemy laws. "We will not return [from Islamabad] until certain members of parliament tender their resignations," Qari Sarfraz Ahmed Rizvi, a protester, told DW earlier this month. The government initially did not want to use force against the protesters. Senator Raja Muhammad Zafar Ul Haq, the leader of the ruling party in the upper house of parliament, told DW he hoped the standoff would be resolved through negotiations. But Haq said the law minister and other members of parliament were unlikely to step down. "We can't punish the entire parliament that worked on the reforms bill," he added. Fatima Atif, an Islamabad-based activist and liberal analyst, says the government is powerless when it comes to confronting Islamic groups. "The ruling party is already in hot water because of its conflict with the military establishment. Even if the government wants to confront the protesters, it lacks the political power to do that," she told DW. Pakistan's liberal analysts and activists say the government shouldn't concede more political space to Islamists than they already have. Tauseef Ahmed, a former professor at an Islamabad-based university, believes the "mainstreaming of jihadi outfits" in Pakistan could harm the country's international reputation further. "The military establishment is dividing Pakistani society along religious and sectarian lines. This policy has harmed the country. The generals do not realize that the international community is observing the situation," Ahmed told DW. But Islamic groups say the country's constitution allows them to take part in politics, contest elections and oppose laws that they deem "un-Islamic."